OLYMPIA – The recovery of Washington’s wolf population continued in 2018 as numbers of individual wolves, packs, and successful breeding pairs reached their highest levels since wolves were virtually eliminated from the state in the 1930s. The Washington Department of Fish and Wildlife (WDFW) today published its annual year-end report, which shows the state has a minimum of 126 individual wolves, 27 packs, and 15 successful breeding pairs – male and female adults who have raised at least two pups that survived through the end of the year. A year ago, those numbers were 122, 22, and 14, respectively. In 2018, for the first time, WDFW documented the presence of a pack west of the Cascade Crest. 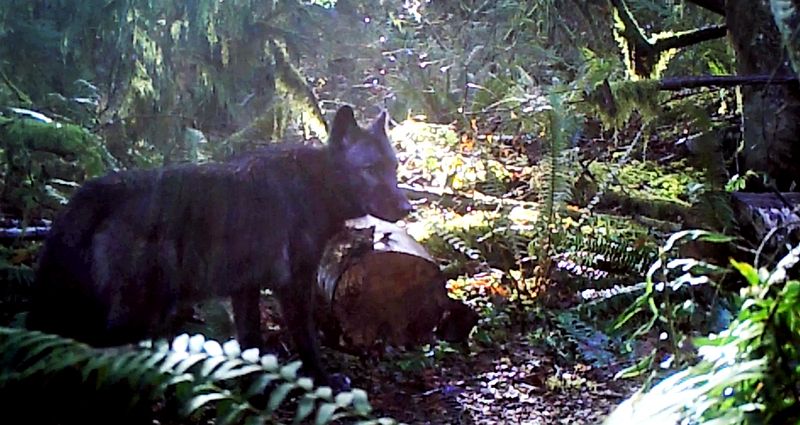 A single male wolf in Skagit County, captured in 2016 and fitted with a radio collar, has been traveling with a female wolf through the winter, thereby achieving pack status. Biologists chose the pack’s name – Diobsud Creek. Virtually eliminated from the state by the 1930s, Washington’s gray wolf population has rebounded since 2008, when WDFW wildlife managers documented a resident pack in Okanogan County. Most packs occupy land in Ferry, Stevens, and Pend Oreille counties in the northeast corner of the state, but the survey revealed increasing numbers in Washington’s southeast corner and the north-central region. Although the 2018 annual count showed a modest increase in individual wolves, the upturn in new packs and breeding pairs in those areas set the stage for more growth this year, said Donny Martorello, WDFW wolf policy lead. 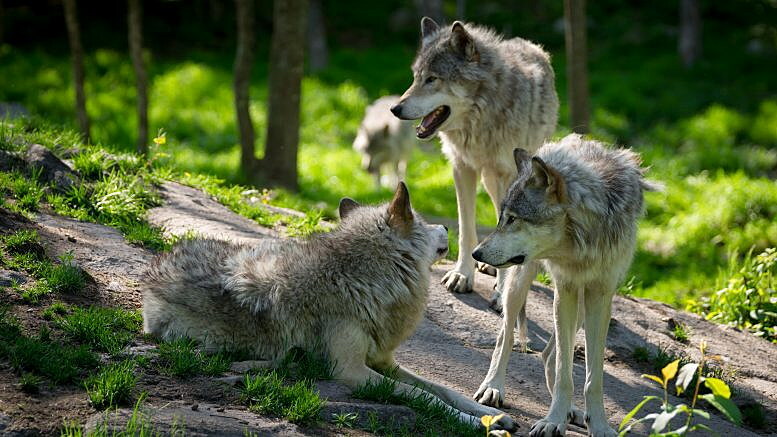 State management of wolves is guided by the department’s 2011 Wolf Conservation and Management Plan, which establishes standards for wolf-management actions. As required for all state-listed species, WDFW is currently conducting a periodic status review of the state’s gray wolf population to evaluate the species’ listing status, Martorello said. 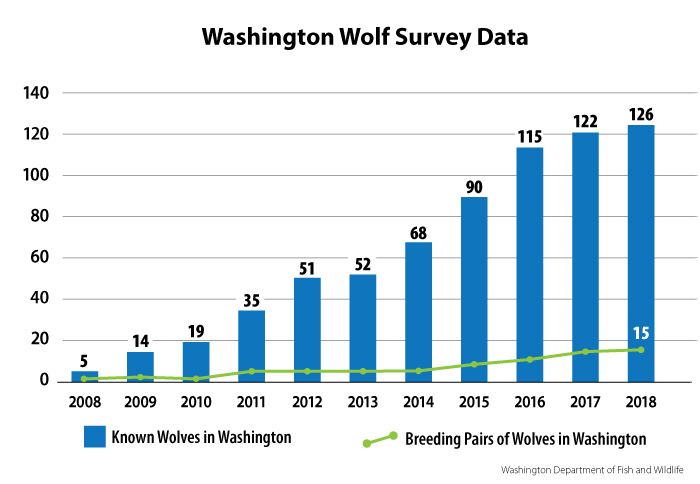 The 2018 annual count reflects the net one-year change in Washington’s wolf population after accounting for births, deaths, and wolves that have traveled into or out of Washington to form new packs or join existing ones. 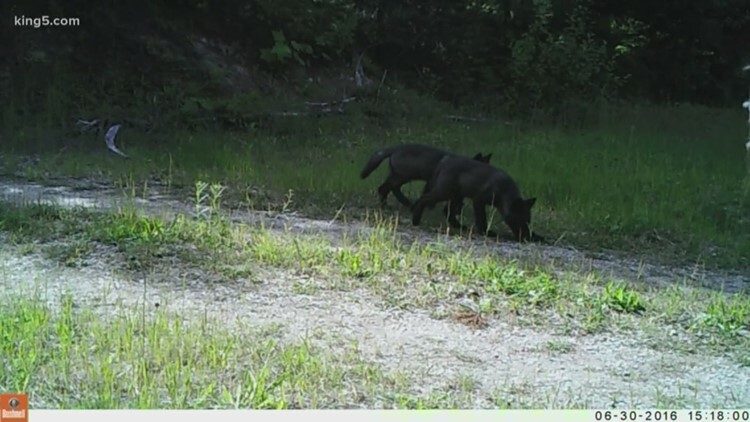 In 2018, two wolves dispersed with one forming the Butte Creek pack in southeastern Washington while the other wolf traveled through Oregon down to Idaho. 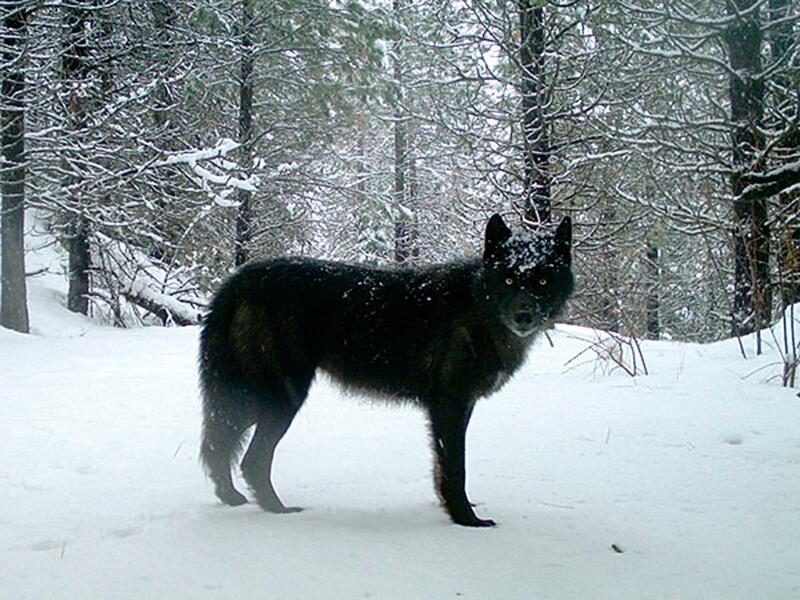 WDFW also recorded 12 wolf deaths during 2018. Six (6) were legally killed by tribal hunters; four (4) were killed by WDFW in response to repeated wolf-caused livestock deaths; and two (2) other mortalities apparently were caused by humans and remained under investigation at year’s end. Ben Maletzke, WDFW statewide wolf specialist, said the 2018 annual report reinforces the profile of wolves as a highly resilient, adaptable species whose members are well-suited to Washington’s rugged, expansive landscape. He said their numbers in Washington have increased by an average of 28 percent per year since 2008. Consistent with the Wolf Plan and the department’s Wolf-Livestock Interaction Protocol, WDFW used lethal measures to remove individual wolves from three packs after non-lethal measures failed to deter them from preying on livestock. WDFW euthanized two members of the OPT pack, and one member apiece from the Togo and Smackout packs. Contributors to WDFW’s annual report include the U.S. Fish and Wildlife Service, the U.S. Department of Agriculture’s Wildlife Services program, the Confederated Colville Tribes and the Spokane Tribe of Indians. A gray wolf at the Osborne Nature Wildlife Center south of Elkader, Iowa. es and Northern Rockies regions. Wildlife advocates want to keep federal protections kept in place until wolves repopulate more of a historical range that stretched across most of North America. 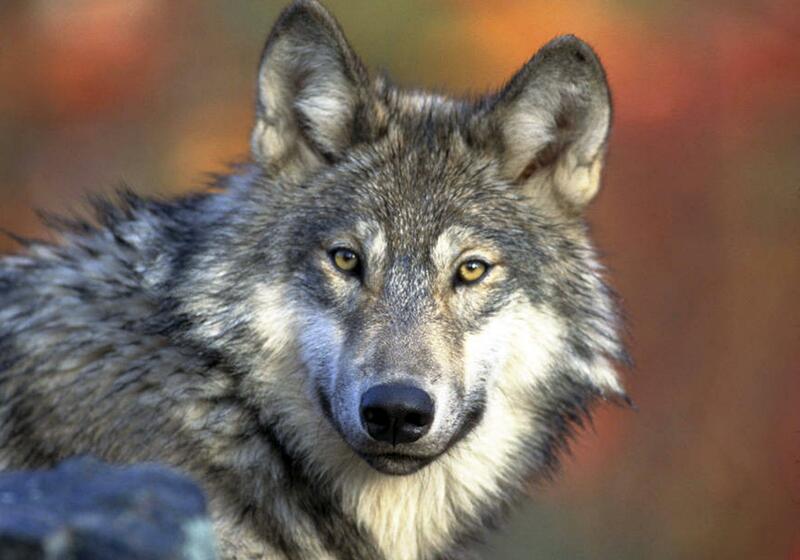 The government first proposed revoking the wolf’s protected status across the Lower 48 states in 2013. It backed off after federal courts struck down its plan for “delisting” the species in the western Great Lakes region states of Michigan, Minnesota and Wisconsin. Flesher reported from Traverse City, Michigan.  Associated Press writer Gillian Flaccus contributed from Portland. A University of Washington researcher told a state Senate committee that it’s possible the state’s population of wolves is closer to 200 animals, compared to 122 the Washington Department of Fish and Wildlife estimated. A Washington state representative from Bainbridge Island wants to stop the state from killing wolves. In response to her legislation, an eastern Washington lawmaker now wants to send the wolves to Bainbridge Island to live. Conservationists focused on wolf recovery know it can be one of the state’s most controversial topics, and dueling wolf bills now show the divide between politics east and west of the Cascades. The first bill was proposed by Rep. Sherry Appleton, D-Bainbridge Island. It reads, “The department may not authorize the killing of gray wolves”. HB 1045 would make it illegal for the state to kill wolves for attacking livestock and instead force their relocation. “It’s a response to a really insulting bill,” Kretz said. Kretz says his constituents are constantly plagued with the challenges of wolf recovery and a bill that would ban killing wolves could ruin their rural economy. “The big impact is the stress on the cattle. I had a rancher sell 200 of his best cows a summer ago because they had been harassed all summer long. They came in, I have pictures, they were two for 300 pounds on your way. They are skin and bones. They don’t have a calf by their side. And they’re not pregnant. They are crazy for being run all summer long,” he said. 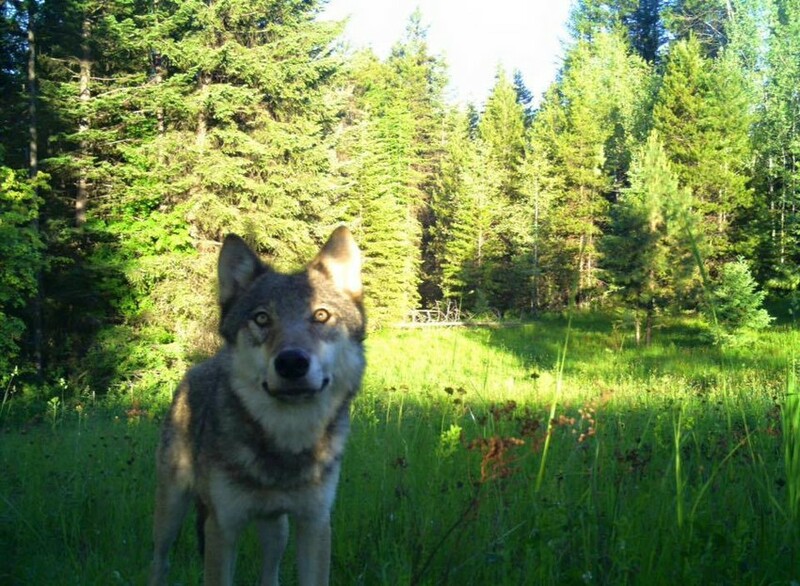 Olympia, WA – Seventh District State Representative Joel Kretz of Okanogan County says it’s time to “share the love” of Eastern Washington predatory wolves with the folks in Puget Sound, who want to protect the critters. A legislator representing Bainbridge Island has introduced legislation that would prohibit the lethal removal of gray wolves. In response, Kretz introduced House Bill 1639, which would create the state’s first gray wolf sanctuary on Bainbridge Island. “If that’s the kind of legislation that someone from Bainbridge Island is going to be running to impose on us who actually have wolves, maybe it would help broaden her mind a little bit to experience the benefits of wolves. So what better place than Bainbridge Island? Kretz bill also provides guidance on when the state may use lethal removal of wolves on the island, specifically limiting such removal only after four dogs, four cats or even two children have been killed. His message is simple: If Westside legislators who live on a protected island hundreds of miles away from wolves want to prohibit Eastern Washington ranchers and farmers from protecting their families and property, maybe it’s time to share those wolves. The measure is awaiting a hearing in the House Rural Development, Agriculture and Natural Resources Committee. Press release provided by the Washington State House Republicans. 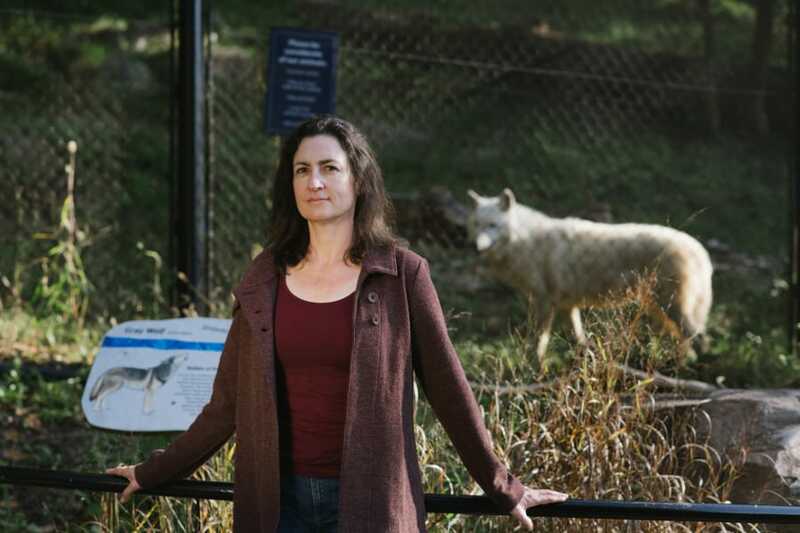 Francine Madden, pictured at the National Zoo in October, is a wildlife mediator based in Washington, D.C.
By Jason Nark, Special To The Washington Post. One summer, over a decade ago, biologists discovered that gray wolves — once driven to near-extinction in the continental United States — were breeding again in Washington. The sound of howling wolf pups was welcome news for conservationists, but not for the state’s $700 million cattle industry. When some wolves began to prey on livestock, age-old tensions were resurrected. Some members of that first pack were poached, despite federal protections. Ranchers whose forefathers believed a good wolf was a dead one now had to contend with government officials and conservationists who had other opinions. Fortunately, there was someone to call for help: Francine Madden and her Washington, D.C.-based nonprofit, the Center for Conservation Peacebuilding. In a city full of fascinating but oddly narrow areas of intellectual expertise, Madden’s is particularly niche: Her job is to make peace between humans who are fighting over wildlife. On a warm October morning, I meet Madden at the National Zoo. The 48-year-old — today wearing cowboy boots a shade lighter than her brown hair — grows animated when she talks about her job, slapping my arm often to drive home a point. A curse or two slips out, though not when a pack of fourth-graders bounds down a path toward a hillside enclosure beside us. “Is that a fox?” one boy asks. “No, it’s a wolf,” another shouts. Indeed, wolves have been trapped, shot and poisoned en masse for centuries, “pursued with more passion and determination,” the U.S. Fish and Wildlife Service notes, “than any other animal in U.S. history.” By the mid-1970s, gray wolves were among the first animals to make the endangered species list. What qualified Madden for this job? In addition to graduate degrees in science and policy from Indiana University, she had spent time as a Peace Corps volunteer in Uganda. There, conservation efforts had helped increase the population of mountain gorillas — who occasionally terrorized villagers, who, in turn, resorted to poaching. Madden helped conservationists and villagers agree on a solution: create teams that could respond quickly to gorilla attacks. In the years since, she has gone on to mediate invasive-species conflicts in the Galapagos and around the globe. In the end, Madden spent 200 days in Washington and 7,000 hours on the phone. (For 3 1/2 years of work, the state paid her nonprofit, with a staff of two, more than $1.2 million.) Conservationists eventually agreed that wolves could be culled if they preyed on livestock. For their part, ranchers agreed to try nonlethal methods, too.